Newsletters can be a great way of regularly keeping in touch with your staff and/or customers to tell them what your business has been up to, or to offer new products and services. 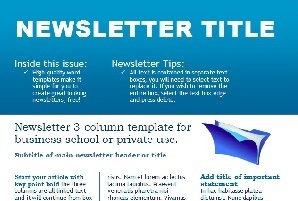 A newsletter can also be a great way to promote yourself as an industry leader in your field. Emailing clients regular articles which highlight interesting and informative subjects relating to your business will help you maintain a good profile. Producing a regular newsletter is also a good way for your business to keep at the forefront of people’s minds, and if its eye-catching and well-written, it will help to produce new leads. I’ve gained extensive experience writing newsletters for a wide range of businesses to put the word out in a fun and compelling fashion. For more information about the newsletter services I can offer, get in touch.